The USB/Parallel Converter is the easiest way to connect your parallel device to the USB port on your PC. This product operates as a bridge between one USB port and a standard Parallel port. Newer PCs are no longer equipped with parallel (LPT) port. But you want to use old parallel printer that is still working just fine. This adpter will add parallel port to your new machine easily. 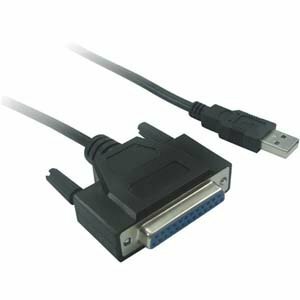 It is Vista compatible.,We carry two types of serial adapter. One with DB25 female male connecotr (150463), and another with centronics 36 male connector (150404).